A top UN official has called for faster progress in Sri Lanka on key promises such as reparations, accountability and a truth and reconciliation commission, saying that failing to implement these could lead to further extremist language and fragmentation of communities. 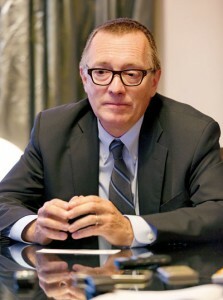 “Sri Lanka had 30 years of hell,” said Jeffrey Feltman, UN Under-Secretary General for Political Affairs, in an interview. “And one shouldn’t assume that, just because those 30 years ended, there is no risk. There is.” He expressed confidence that politicians and officials he met during his visit from July 19-21 understood those risks and would do their best to ensure they don’t manifest. At nearly every discussion that Mr Feltman attended, recent attacks on Muslim and Christian minorities came up. Sri Lanka was not immune from a quick escalation of these sorts of events, as have happened elsewhere in the world, he warned. While the Government’s strong statement, including calling for accountability of those responsible, was welcome, “it took a while to get out”. There has been too much impunity in Sri Lanka for, not just crimes related to the 30-year conflict, but for corruption. Mr Feltman hoped, therefore, that accountability for attacks on Muslims and Christians would be followed up. But he also said there was a much greater engagement of Sri Lanka with the world, in comparison with the period before 2015. The country was now expanding its peacekeeping contributions again, while the relationship between various parts of the UN and the Government “are quite constructive and positive”. And yet, “all of us would have liked to have seen more implementation of the initiatives that were envisioned back in 2015”. These include truth and reconciliation initiatives, and ones related to accountability, reparations and constitutional change. These were all intended to put Sri Lanka on a stable footing again, with harmony among communities, relief for victims and solutions to longstanding grievances. Mr Feltman said they believed strongly that the current Prevention of Terrorism Act needed to be replaced. There has been considerable work done on a new Counter Terrorism Act. The Government has taken suggestions from experts about how to make sure the law serves the purpose of protecting Sri Lanka from terrorism while guaranteeing the rights of individuals. “But we also believe that more can be done to see, before the law is finished, that it truly does conform to best practices internationally, that it truly does provide the type of judicial protection for Sri Lankan individuals,” he said. Mr Feltman said he was pleased to have been in Sri Lanka on the week the President signed the official gazette for the OMP. He said he hoped every community will welcome it because “every community has missing persons”. “But Office of Missing Persons is not yet operational, clearly,” he continued, calling for a selection process to produce credible, competent commissioners, and a budget. The Government meanwhile, needed to be both behind the OMP, and allow it to be independent.